A ramjet engine burns during a flight test for the P-61 in 1947. 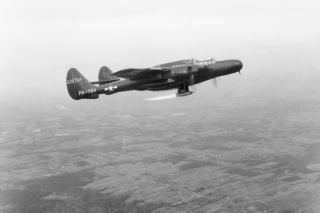 In this historical photo from the U.S. space agency, the P-61 airplane pictured in flight test with ramjet burning. The P-61 aircraft was built by Nothrup and used by the Aircraft Engine Research Laboratory or AERL of the NACA to test the new jet engine. The AERL is now NASA's John H. Glenn Research Center in Cleveland, Ohio.